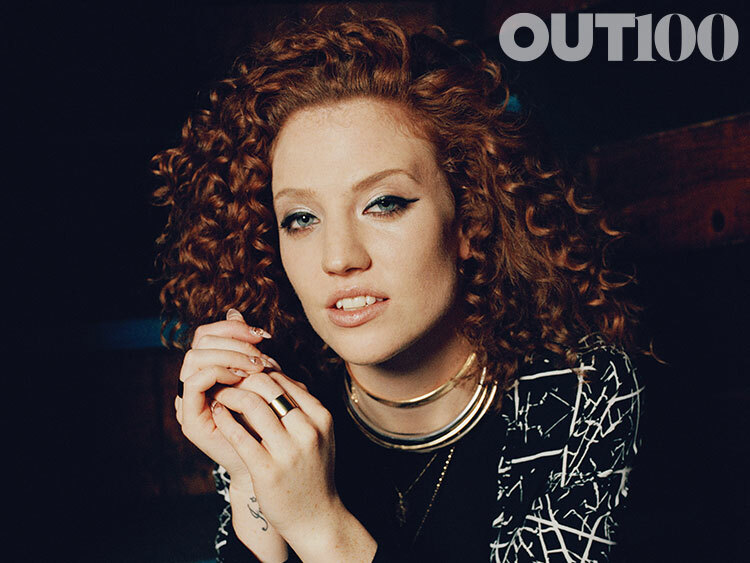 British singing sensation and Out 100 Honoree Jess Glynne has had one hell of a year. After breaking out in 2014 with the Grammy-winning Clean Bandit single, “Rather Be,” the 26-year-old dancehall songstress dropped her debut album, I Cry When I Laugh, in summer 2015 and immediately leapt to #1 on the U.K. charts. Considering the album was inspired by a breakup with a girlfriend, the release is surprisingly joyous—and irresistible to boot. In no time Glynne’s sonically luscious, disco-tinged dance pop got stuck in our heads, in our playlists, and in dance clubs and radio stations around the globe. It has went on to sell double platinum, while birthing a record-breaking five #1 singles in the U.K., a musical feat matched only by Cheryl Cole. Damn. Glynne is now slowly creeping her way into household name status Stateside, where she’s currently wrapping up her I Cry When I Laugh tour. One of her final North American stops before jumping back over the pond will be New York City tomorrow, Feb. 6, to perform at the Human Rights Campaign (HRC) Greater New York Gala. Held at the Waldorf Astoria, the HRC is slated to honor New York’s Governor Andrew Cuomo and Academy Award-winning actress Sigourney Weaver for their work as LGBT allies. The honors will be paired with an intimate performance from the chart-topping Glynne. We caught Glynne on the road leading up to the event to chat about standing with the HRC, her incredible year, and advice she received from Sam Smith. Out: First of all, congratulations on this performance at this year’s HRC Greater New York Gala. Very exciting! Why did you want to get involved? Jess Glynne: I wanted to get involved because I think it's really important that everyone is equal no matter who they love or how they want to be loved and this is what HRC is all about. What can we expect? Your live sets are pretty high energy and euphoric—will you be bringing that energy to the stage? It's going to be slightly stripped back to what I do for my live show but still full of energy and emotion. You’ll be joined by the evening’s honorees Governor Andrew Cuomo and Sigourney Weaver. What’s your favorite Sigourney Weaver movie? I love Sigourney Weaver. Ghostbusters—she was fabulous in it, but she really makes me laugh in the film Heartbreakers. HRC has said that they wanted you to join them in part because of your outspokenness in “defying labels" and for your dedication in the fight for equality. Why do you think a dialogue about defying labels is an important one to have? I think it's important because I don't believe you should be labeled anything. I don't think there's an answer to what love is and I don't believe you should be put in a box. We all deserve to just love who we are and who we want with no judgments passed. You’ve been busy on the road touring North America. How are you holding up? Have the States been treating you well? I'm doing well—the tour has been amazing so far! The crowds are so welcoming. I couldn't be more excited. Are there any ways American LGBT culture differs from that of the U.K.? Because America is a lot bigger I think there's a lot more people to reach compared to the U.K.
What’s feedback from fans on the road been like? I Cry When I Laugh has clearly resonated with audiences the world over. Why do you think that is? The feedback has been wonderful. My music seems to have really reached out to people. I like to believe it's because my lyrics are honest and real and they are stories that anyone can relate to. Last year was undeniably your breakout year. What’s one of your fondest memories? I think my album being released was the most surreal day. I plan to enjoy, live, love, and learn! You released a video for “Ain’t Got Far to Go” earlier this month. What was filming in Cuba like? Why did you decide to make “Ain’t Got Far to Go” the follow-up to your record-breaking fifth #1 single, “Don’t Be So Hard On Yourself”? Filming in Cuba was so amazing! [I was] so lucky to experience such a beautiful country. "Ain't Got Far To Go" was always going to be a single—it was just about when would be the right time, and now feels better than ever. It's such a special defining song on the record and feels perfect to be on the airwaves! We’re big fans of Sam Smith at Out, and it’s easy to see parallels in your overnight rise to fame. Has he given you any advice on managing newfound fame or relationships in the spotlight? We have spoken [about it], and I guess we both just talk about keeping the right people around you and not getting too ahead of yourself. It's important to keep your feet on the ground in this industry. And you’ve got the BRIT Awards coming up. I was particularly intrigued to see you sharing the ballot with the late Amy Winehouse. I'm so excited for the Brits and can't believe I'm in the same category as her. It's very surreal! Did you happen to see the Oscar-nominated doc, Amy? Do you think it has a shot at that Oscar? I did see the film, I think it was honest and very special to see. For more information on Jess Glynne, visit her website. For more information on the HRC Greater New York Gala, visit hrcgreaterny.org.